This month we take up the story of the Arnold family’s heroes, cousins to Benedict Arnold V, whose very name has become synonymous with Traitor. Both branches derive from the patriarch in America, William Arnold who arrived on these shores in 1635 and is heralded as the head of the Arnold family in America. The fourth and youngest child of William and Christian Arnold was Stephen (1622–1699) who married Sarah Smith (1629–1713), the daughter of Edward Smith of Rehoboth, Massachusetts. Stephen and Sarah had seven children. Stephen was either a Deputy to the General Assembly or colonial Assistant nearly every year for a period of three decades. He and his family settled in Pawtuxet near his father, and had a garrison house along the Pawtuxet River. Stephen was 13 years old when he sailed from England to the New World with his parents and relatives, and he was the last surviving member of that sailing party. Stephen Arnold…came with his father to New England and after residing some time in Providence, removed to Pawtuxet in 1638, where, and at other places in Rhode Island he had large landed property, a portion of which he called the “Coweset Purchase;” he divided among his sons in his lifetime. He became a man of wealth and was prominent in public affairs and filled important offices in the Colony. He was chosen Deputy-Governor in 1664 and Assistant in 1667. His Will dated 2nd June 1698, was proved 12th December 1699; m. 24th November, 1646, Sarah SMITH, dau. of Edward Smith of Rehoboth. The first representative of the Arnold family in Morris county was Stephen Arnold, who came here about the year 1720 from Woodbridge, this state. He is supposed to have been born in Rhode Island, a son of William Arnold, who with his brother John came from Cheselbaum, Dorset county, England, in 1587 [sic], and settled at Providence, Rhode Island. All the Arnolds of America, including Benedict Arnold, have sprung from these brothers. Stephen Arnold died in Morris county and was buried at Whippany. His son, Samuel Arnold, was born in Morris county, on the 5th of November, 1727, and died October 3, 1764. He married Phebe Ford, a sister of Colonel Jacob Ford, Sr., and among their children was Jacob Arnold, born in Morris county, on the 14th of December, 1749, his death occurring March 1, 1827. He was a celebrated man in his locality during the Revolutionary war; was commander of the light-horse militia of Morris county, which served under Washington in a number of campaigns, and was promoted lieutenant-colonel in the Continental army. His light-horse company was an independent organization, raised entirely in Morris county, and it won an enviable distinction for its long and brilliant career. 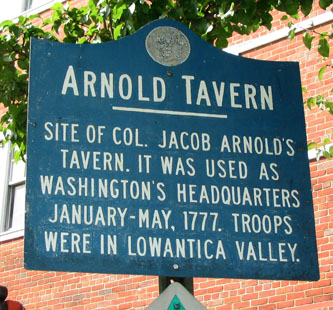 The Colonel was also well known as the proprietor of the Arnold tavern in Morristown, on the west side of the public green, where Washington and La Fayette spent one winter as his guests, holding many conferences with all the leading men of the army, and where also the balls of the officers were held. Colonel Arnold was also sheriff of Morris county in 1780 and 1786, and assemblyman from the same county in the years 1784, 1785, 1789 and 1790. He also was one of the twenty-four gentlemen who organized the Morris Academy, on the 28th of November, 1791. For his first wife Colonel Arnold married Elizabeth Tuthill, who was born September 15, 1753, and died May 7, 1803. The children by this marriage who grew up were Hannah, Jacob, Abram, Charles and Eliza M. By his second marriage the Colonel was united with Sarah R. Nixon, who was born in Morristown, October 1, 1783, and died April 9, 1843, and by this union there were seven children, namely: Phoebe P., Mary A., Silas H., Abram B., Elizabeth M., Samuel D. and Edward A., -- all now deceased. 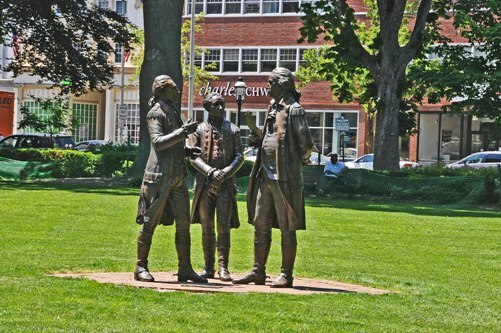 George Washington visited Morristown two years (May 1773) before the War of Independence broke out. He was impressed by the town and its citizenry. After the resounding victories of the Continental Army at Trenton and Princeton in 1777, Washington sought housing for himself and his officers in Morristown. Morristown was selected for its extremely strategic location. It was between Philadelphia and New York and near New England while being protected from British forces behind the Watchung Mountains. It also was chosen for the skills and trades of the residents, local industries and natural resources to provide arms, and what was thought to be the ability of the community to provide enough food to support the army. This large Georgian style home was built in the early 1770's for Jacob Ford, Jr., an iron manufacturer, and his family. Mr. Ford also served as a colonel in the Morris County Militia during the Revolutionary War. Ford died in January 1777 while 35 soldiers from Delaware were briefly quartered in the house. In December 1779, Mr. Ford's widow, Theodosia, allowed General Washington to use her home as his headquarters during the winter of 1779-1780. While Mrs. Ford and her four children moved into two rooms of the house, General Washington, his wife Martha, five aides-de-camp, eighteen servants, a number of visiting dignitaries and sometimes guards took over the rest of the house. Morristown NJ The Ford Mansion is a classic 18th-century American home built by Jacob Ford, Jr. in 1774 and now owned by the National Park Service as a part of the Morristown National Historical Park. It was acquired by the Washington Association of New Jersey in 1873. The Georgian styled mansion is known for being George Washington’s headquarters from December 1779 to June 1780. The mansion is located in Morristown, New Jersey. 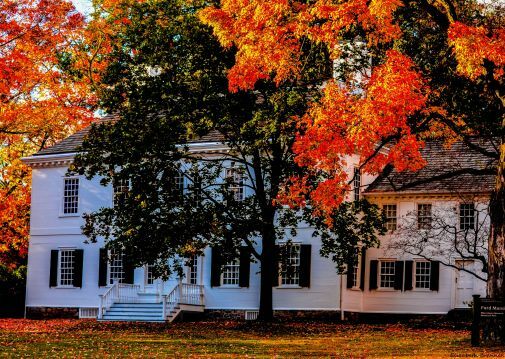 Today, the home houses many historic relics from the Revolutionary War and has been painstakingly restored to reflect its likely appearance when George Washington, his wife, and his officers stayed there to make their final plans to free the colony from the greedy grasp of its British crown. Adjacent to the Ford Mansion is the Museum Building, a steel building designed to be fireproof and offer the greatest security for these priceless articles. During Washington's stay, Benedict Arnold was court-martialed at Dickerson's Tavern, on Spring Street, for charges related to profiteering from military supplies at Philadelphia. His admonishment was made public, but Washington quietly promised the hero, Arnold, to make it up to him. Alexander Hamilton courted and wed Elizabeth Schuyler at a residence where Washington's personal physician was billeted. Locally known as the Schuyler-Hamilton House, the Dr. Jabez Campfield House is listed on both the New Jersey and National Register of Historic Places. Morristown's Burnham Park has a statue of the "Father of the American Revolution", Thomas Paine, who wrote the pamphlet Common Sense, which urged a complete break from British rule. 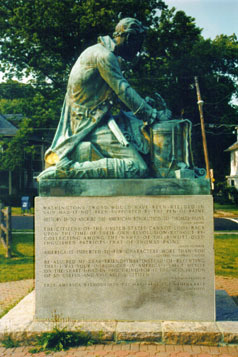 The bronze statue, by sculptor Georg J. Lober, shows Paine in 1776 (using a drum as a table during the withdrawal of the army across New Jersey) composing Crisis 1. He wrote "These are the times that try men's souls ...". The statue was dedicated on July 4, 1950. Statue of Thomas Paine, "The Father of the American Revolution" Sculpted by Georg Lober. Dedicated on July 4, 1950, the 174th Anniversary of American Independence. It was presented to the people of Morristown by the Thomas Paine Memorial Committee; Joseph Lewis, Secretary. Once again, genealogical research has uncovered another of life’s marvelous coincidences: the juxtaposition of one family’s fame and infamy reflected generations later within the bounds of one marriage. It is the discovery of these little bits of irony and mystery that keep family researchers intent upon their passion. Even in this discovery, there is mystery. 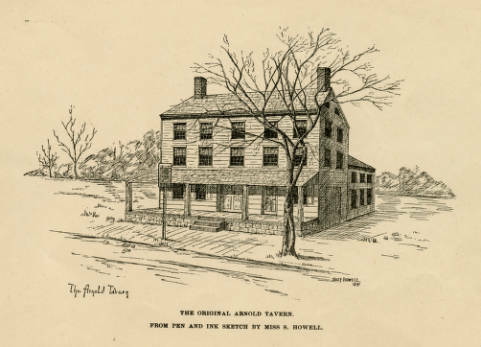 A couple of years ago, when I first discovered my husband’s lineage from Jacob Arnold, we were able to secure a copy of a charming little booklet that documents the history of Jacob Arnold’s Tavern and the roles his family played in the Revolutionary War. 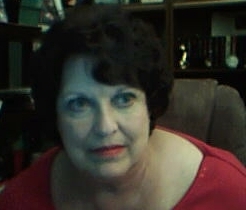 That booklet is one of my most cherished items, along with the various books and printed genealogies collected through the past thirty or so years. Phoebe Arnold (1810 - 1883) Daughter of Stephen Arnold Rev.